Christmas came a little early on the seasonally appropriate Christmas Hill! 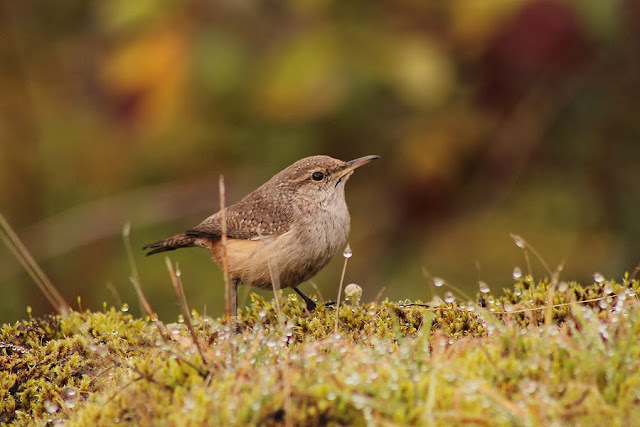 On December 11, a birder by the name of Courtney Cameron photographed an interesting wren near the summit of Christmas Hill and she wondered whether it was a Rock Wren. There is always that moment where you're not quite sure what you're about to see as you check a photo of a possible rarity. In this case, the very nice photo did not result in a cringe - it was a classic Rock Wren! I have been quite busy over the past week or so and there wasn't a daylight moment to spare until today. Even today was a little slim for time, but I decided I wanted decompress with a little bit of rarity chasing. When I arrived, I dashed along the trail and bounded up rock steps to get up to the top as quickly as possible. I bumped into Mike Ashbee on the hill and he hadn't had luck connecting with the wren. 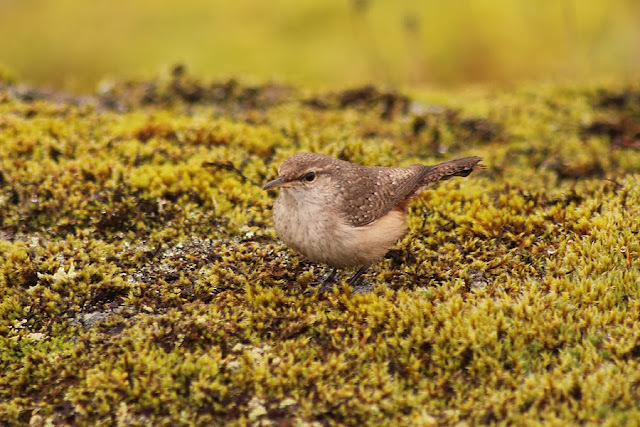 We chatted while covering ground and soon found our party size doubled, with Warren Lee and his daughter Rebecca hoping to spy the rare wren from the interior. We tried fanning out and it was starting to look like we were going to dip on the wren that likes to dip on rocks. 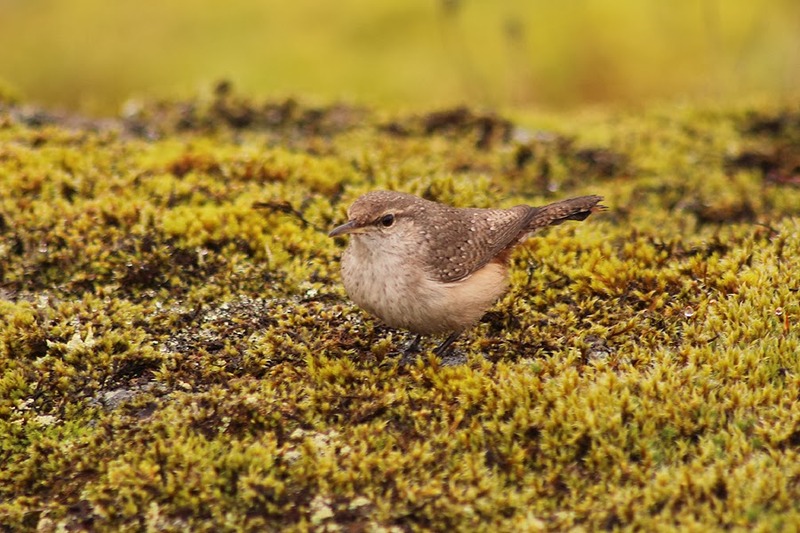 Mike and I made our way to the southwest corner of the hilltop and suddenly a buffy wren darted up from a little gap in a rock outcrop and started bobbing on a patch of moss. "That's it!" I exclaimed and I immediately looked around for Warren and Rebecca. They weren't in sight, but I figured they were likely right at the main summit. Mike kept tabs on the wren and I hustled up to the top and found them moping about and gave them the secret hand signals to indicate the wren had been found - for the record, the signals included a closed fist resting on an open hand for "rock" and both hands being lowered as fingers fluttered for "rain". It seemed close enough and got the point across. 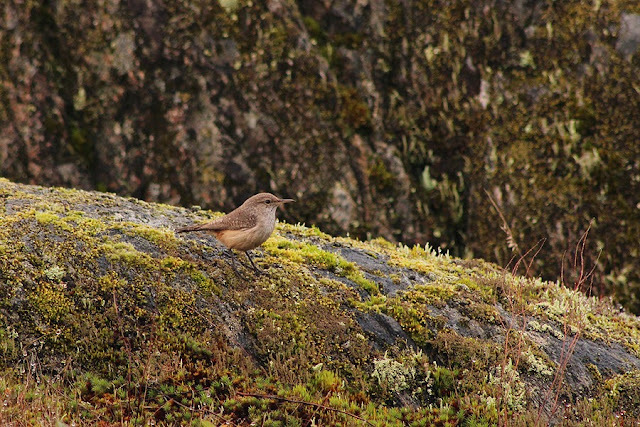 We all followed the wren around for the next half an hour or so as it actively fed and bobbed up on top of rock outcrop peaks. It was an extremely cooperative bird and we all enjoyed watching this charismatic, wayward wren do its thing. For some awe-inspiring shots, stop in at Mike Ashbee's photography page to see his shots of the Rock Wren and much more.